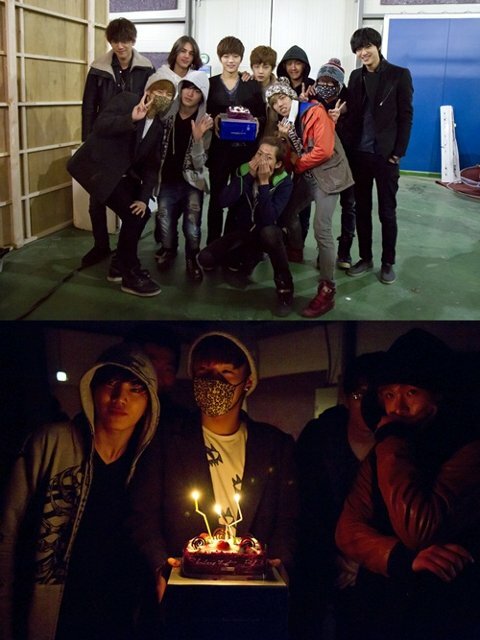 On the occasion of the birthday of Infinite member L who is currently starring in tvN drama series Shut Up Flower Boy Band, on March 13th, 2012, the members of Infinite band and Shut Up Flower Boy Band prepared a surprise party for L.
At about 2am in the morning of March 13th, 2012, Infinite appeared without notice at the filming set near Paju. The members have came to congratulate L on his birthday after finishing the last activity. Because of the shooting schedule for the drama, L could only simply celebrated the 21st birthday on the Paju’s set with Sung Joon, Yoo Min Kyu, Lee Hyun Jae, Kim Min Suk and others. Thus, when other Infinite members appeared together with birthday cake and song, he could not conceal his joy. To keep secret, gag order was issued not only the management agent, but also to the crews on the scene. It is learned that surprise birthday party by Infinite also made the staffs felt happy. On the other hand, Shut Up Flower Boy Band starring L broadcast every Monday and Tuesday at 11pm.